Oakville – christopher consultants, ltd.
christopher consultants has worked on the Oakville project since 2014 and has provided engineering support throughout the conceptual and preliminary design phases. christopher has also provided utility designation and mapping, and boundary and topographic surveys on the project. christopher continues to provide final engineering design for the development’s infrastructure and preliminary engineering for the DSUP approvals of the individual blocks. Oakville is a 1.5 million square-foot development in the Oakville Triangle area of Alexandria that will transform an industrial site into mixed-use residential and retail. The first phase of development will include 132,000 square feet of retail, 130 for-sale condominiums, 400 apartments, a 190-room hotel and a 130,000 square-foot office building. 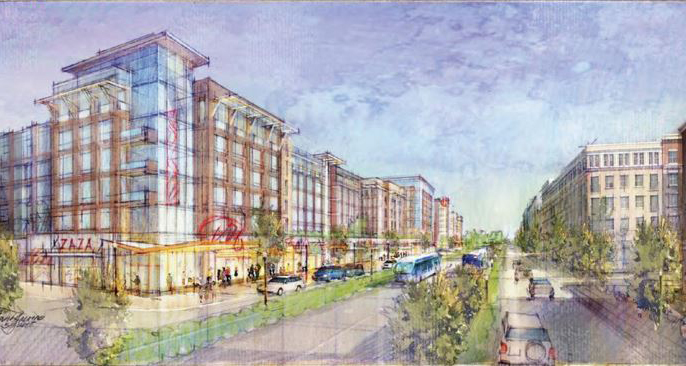 The site is adjacent to the Potomac Yard development with Route 1 bordering it on the east side, Mount Jefferson Park to the west, Fannon Street to the south and Calvert Street to the north. StonebridgeCarras expects the project to break ground in the summer of 2017 with the first phase of development being completed in 2019. The project is being managed by real estate investment firm StonebridgeCarras and designed by architect Cooper Carry.